The summer can be a rough time for UofL basketball fans; there just isn’t anything going on. But the reality is the summer is where you build the foundation of your team for the years to come and Coach Rick Pitino and staff are showing just how important this time of recruiting really is. The staff has been very busy as of late: Who are they watching? Who is really interested in UofL? And is there a chance 2013 could be the best class Pitino has ever had at UofL? We will answer all these questions and more so let’s get started! *Anton Gill– I still don’t think that everyone has grasped just how big a steal UofL got when they received the early commitment from Anton Gill. At 6’4 185 lbs., Gill is a freak athlete that can dunk on just about anyone or step out and drain the 3 ball at will. This past week Gill was hampered by an injured ankle but still managed to lead his AAU team, Gardner Road, with 18 points against a talented Florida Elite squad. The best thing about having early commits like Gill and Quentin Snider in ’14 is they are on the phones with other recruits. Gill says he has been speaking with Jordan Mickey, Troy Williams, and Anthony Barber the most but has also been in the ear of many others. 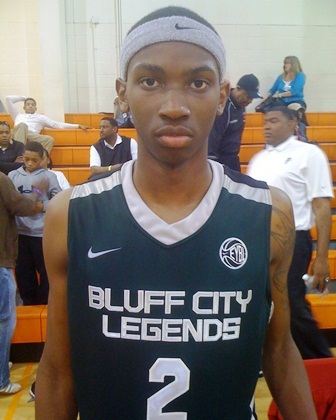 In the game against Florida Elite, 2013 PF Chris Walker said Gill would point to Coach Pitino who was in attendance and say “Look Chris he’s watching you.” I believe Gill is solid with the ‘Ville and I fully expect him to sign in the fall. *Package Deal– By now we have all heard the rumors that Anthony Barber (left) and Troy Williams (right) are considering playing together in college and that the two colleges under consideration for that Package is Louisville and Alabama. While I’m not a fan of “Package Deal” rumors, there seems to be some legit feet to this one. Williams confirmed to our own Jeremy Wahman that he and “Cat” Barber were indeed having these talks and Barber could be making his decision after the Peach Jam which runs from July 18-21 or right before his Sr season starts and this is where it gets tricky. In my opinion, I believe it’s a two-horse race for Barber between Kansas and UofL. 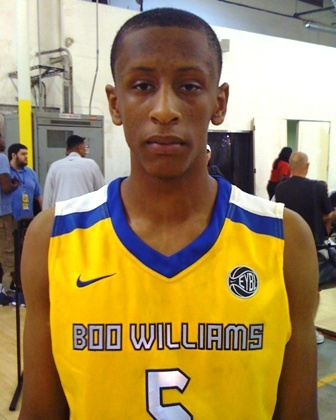 If Barber does in fact decide after this week’s Peach Jam event it will probably be for Kansas, considering he has been there and they have been the leader for a while, and without Barber I don’t see Troy Williams and his strong Nike ties at UofL. However, if Barber decides to push it off and takes a visit to the ‘Ville in the coming months, I believe Coach Pitino has positioned UofL to overtake Kansas and land the services of Barber and ultimately Williams as well. And folks, if the 2013 class starts off with Anton Gill, Barber, and Williams, it could ultimately be the best class we have ever seen at UofL. *Chris Walker– Chris Walker is one of the more talented big man prospects that have come around in a few years. Walker has great foot work in the post, can shoot the jumper, is a great defender, and his passing ability is extremely under rated. Last week at the Adidas Invitational in Indianapolis, Walker ran the gauntlet of great PF and C in the nation and showed out against each one, leading me to make a statement I still stand by: that Walker is Top 3 overall in my mind with Parker and Harrison. As far as Chris’s recruitment, it seems as he tweeted today that his top 4 are UofL, UK, Kansas, and Florida, and he holds offers from all but UK. If I had to say now, I would say Florida was probably in the lead for Walker, a Florida native. The draw of playing with AAU teammate Kasey Hill may be too much. Walker told me earlier this week he for sure had plans to visit UofL in the coming months and I believe that visit will go a LONG way in helping the Cards chances with Walker. Walker says he hears from UofL assistant Kevin Keatts every day and has a strong relationship with the staff. While he’s not opposed to signing in the early period, I wouldn’t expect a commitment anytime soon. 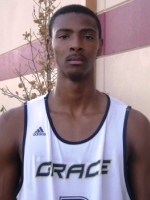 *Jordan Mickey– The 6’7 PF out of Texas is not very out spoken when it comes to his recruitment. He recently went on a visit spree that included UofL, UK, Ohio St, SMU and a few others and came away most impressed with UofL and Ohio St. He said they should both definitely get 2 of his 5 official visits in the fall. UofL has offered Mickey but I expect UK to also become a major factor with Mickey if they were to offer. Mickey’s teammate, 2013 Center Karviar Shepherd, is also very much on UofL’s radar so it will be interesting to see how this duo plays out if one was to commit early. *Tyler Ennis– Ennis may be the best pure PG in the nation outside of Aaron Harrison. At 6’3 Ennis is just the type of guard that Pitino and crew are trying to reel in. In a recent interview, Ennis said Syracuse, UofL, and Illinois are standing out above the rest on his list and he plans to visit all very soon. The addition of Barber would probably end anything with UofL and Ennis but I’m not sure it will matter either way as me and most others believe Ennis is a lock for Cuse. *Moses Kingsley– Kingsley took an unofficial visit to UofL earlier this year and seemed to be on the verge of being UofL’s next commit, but out of nowhere kind of took a back seat from the recruiting process. While on campus, Kingsley said he connected well with UofL’s Gorgui Dieng and loved everything about the program. Many rumors began to come out that Kingsley was no longer interested in UofL. Since Kingsley’s visit he has moved to Huntington Prep and Coach Rob Fulford told Cardinal Sports Zone that Kingsley is however still very much considering UofL. This is one recruitment we will all have to keep a close eye one. 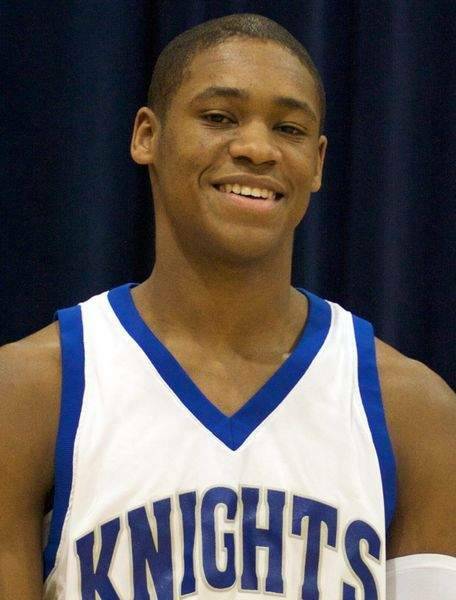 *Demetrius Jackson– Jackson is a 6’1, 4* PG out of the state of Indiana. As one of the top prospects in the state Jackson has been receiving interest from many different schools such as Florida St., Illinois, Michigan St and Kansas to name a few. If UofL doesn’t land Barber or Ennis, look for them to put an all-out assault on Jackson. 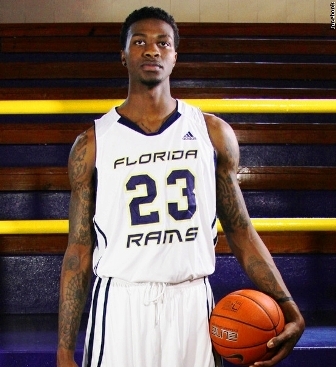 *Kyle Washington– This 6’9 180 lbs. Center plans on visiting UofL very soon. UofL commit Anton Gill had very good things to say about Washington lately and believes he would be a great fit with the Cardinals. Washington is a lefty with a knack for scoring around the basket. It would not shock me to see this one come down to UofL and UConn unless UofL picks up one of the more coveted bigs before then. *JaJuan Johnson– Johnson is one of the more intriguing prospects out there right now for the Cards. At 6’5 he is definitely the type of 2/3 combo guard that fits well under Pitino. Johnson’s jumper has become much more consistent as the summer AAU circuit has gone on and when you add that with his athleticism you have a lethal combination. Even though they are very similar in size and game, the thought of Gill and Johnson side by side for the next few years is a pleasant thought. Johnson has not narrowed his list but has stated that when he goes to 5, UofL will be on there. I also look for Memphis, Florida and possibly UK to make that list. Johnson had a great visit to UofL in June and if Troy Williams doesn’t pop for the ‘Ville, I absolutely see JaJuan in Red and Black. *Kentan Facey– Facey already has some ties to UofL considering his long time mentor is non-other than former UofL Center Samardo Samuels. Facey is a 6’8 PF prospect that runs the floor extremely well and can finish with authority. Kentan has only been in the States for around a year and a half and seems to be getting comfortable at his high school in New York. The Cards staff will continue to evaluate Facey as the summer rolls on and I believe UofL will make his list as he narrows it in the coming weeks. 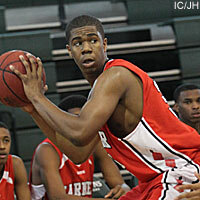 Facey also has offers from UConn, St Louis, Florida St and Virginia Tech. *Joel Embiid– Say what you want about Coach Pitino, but he is in my opinion the best there is at finding “Diamonds in the Rough” and that’s exactly what Cameron native Joel Embiid is. 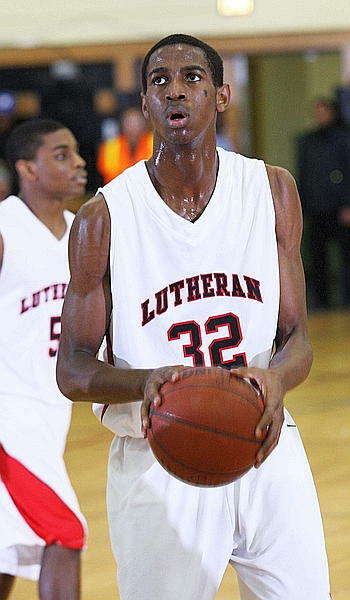 Embiid stands 7 foot tall but runs the floor extremely well for a kid that size. He is very raw talent on the offensive end of the floor but that stems from the fact he has only been playing ball for a little over a year. But that hasn’t stopped many on the AAU circuit from comparing Embiid to UofL’s own Gourgi Dieng. UofL has not sent an offer toward Embiid but I would not be surprised to see that change soon considering UofL has a need at the 5 position in the coming years. Embiid currently plays at Montverde High School in Florida along with 2014 star D’angelo Russell but has said that could be changing soon. 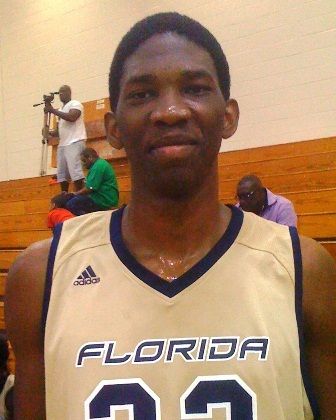 While Embiid currently holds no offers he has been receiving strong interest from UofL, Florida, UCLA, Mississippi St., and VCU to name a few.